I’ve seen nice pictures and heard stories of Cam Pha, the “mining city” for a long time via text messages and emails. Till the day I directly approach this amazing city, I have “crush” on it right a way. Strangely enough, I can not explain why this city is so close to me. 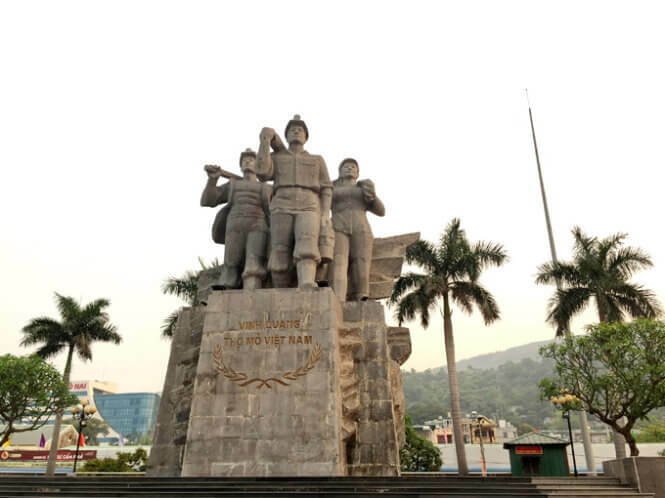 It turns out to be the hometown of my ex-boyfriend who used to return home when feeling depressed during studying and working days in Hanoi. 1. About 200km to the Northeast of Hanoi, an hour of traveling by car from Ha Long, Cam Pha city is on National Highway 18 to Mong Cai and near Bai Tu Long Bay, Van Don Island to the South. Being naturally favored a sea, Midland, and Delta, however, Cam Pha is prominently featured with hills and mountains, occupying more than half of the area. 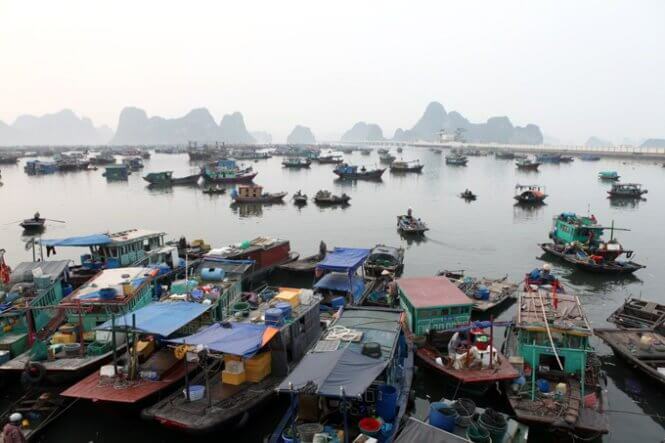 In addition to a charming sea, this city own hundreds of limestone islands. These distinct characteristics of geology have intentionally made it gain considerable advantages in terms of tourism. However, coal mining is a big problem and challenge facing the authority of this city. 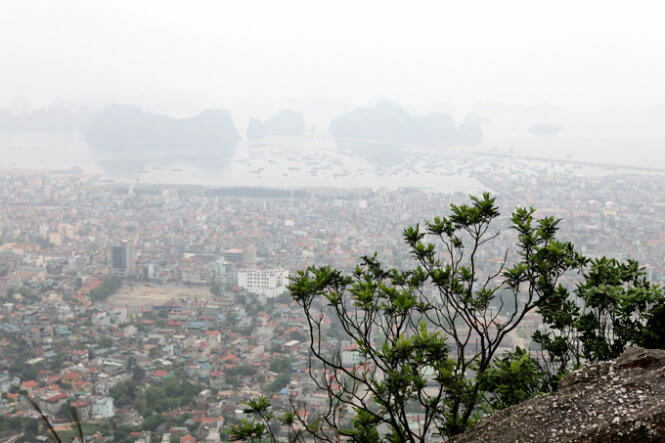 Traditionally, tourists just go over Cam Pha to get to Van Don island district or Mong Cai city, the Northernmost city of Vietnam. It seems that no one wants to stop in the city of coal smoke and dust blurring trees and fences along the road and lorries carrying coal all day long. 2. We arrived in Mong Cai city at 2 a.m. Surely, the streets are still dark and empty. Moreover, the luck seems not to say “hi” to us because some hotels we did drop by didn’t have available rooms. There was no other way, we called some local friends and waited for less than 5 minutes to be taken to the resthouses. At 6 a.m of the next morning, they are waiting for me at reception hall for breakfast. This group of friends includes those whom I did meet outside, chat on Facebook, or even whom I have never talked or seen before. However, no matter who they are, what they do and how old they are, we quickly get acquaintance thanks to their friendliness and hospitability. So, we favorably called them “Pha young guys”. They took us to a seafood market called Ben Do. The photographers must have fully “explored” the features of this market. Therefore, young men and women do not hesitate to take their friends there to see the market and take nice pictures in the early morning. We buy food for lunch, too. Do Market is such a beautiful scenery at sunrise in my mind. The images of fishing boats getting ashore, children getting on board with their parents and the rustic but touching beauty of these fishermen are captured by a “real” photographer. Ben Do starts from 3-4 a.m and ends at 7-8 a.m, so you must wake up early to morning to see what the locals do for their living. Do seafood market is divided into 2 turns, one for wholesale traders, other for retail traders who sell all day with categorized foods and higher prices. We went the wet crowded seafood market full of sellers and buyers, then climbed up a two-storey house near the edge of the sea. From far distance, the fish market is very colorful. The nice pictures of this market must be taken from this place. Some of my friends are quite "professional” about seafood. They observed various types of fish and introduced me them such as mackerels, rays, fish, shrimp, crab, shellfish, etc. I was highly impressed by the sounds of the bargain, knives chopping fish that seem to stir a corner of the sky. We just walked along for a while but those types seafood are sold out. That market attracted both locals and tourists. They wear female workers of mining factory, neatly-dressed tourists and young guys liked us. They came here for 3 main purposes, including buy foods for meals, buy seafood as a gift for friends and relatives, and even, just walk along to witness the operation of a seafood market. 3. After having a nice homemade seafood “feast” in a friend’s house, they took us to the mountain where members of Cam Pha photographing club often gather to observe the whole city. It is actually a hill, not totally a mountain. It is located at Cam Thuy Ward with a small trail which leads to the mountain slope and is surrounded by wild grasses and pine trees. It took us half an hour to get the mountain peak amid the hot weather of summer. This spot offers us an overall view of the city hiding in the cloud, houses sprouting to each other and numerous fishing boats and limestone islands floating on the surface of the sea. Wondering along the roads of mining city, some of my local friends told us the about signals indicating that that hill was under city planning, so not allowed to explore. Therefore, the beautiful natural scenery might be preserved and conserved. The weather did not support our photographing then. A “visible” natural blanket of smoke or even dust did make houses, boats, and even coal conveys on the sea blurred. Then I ask myself some questions, where is the fish market where I did get up early to visit? Where is the square honoring Vietnamese miners? Is it sad months or calm and pleasant moments in the arms of friends? 4. It was really interesting to see those mischievous guys trying to stand on the edges to take "virtual” pictures while the wind was blowing up their hair and jacket. These memorable moments are probably saved at a corner of my heart.